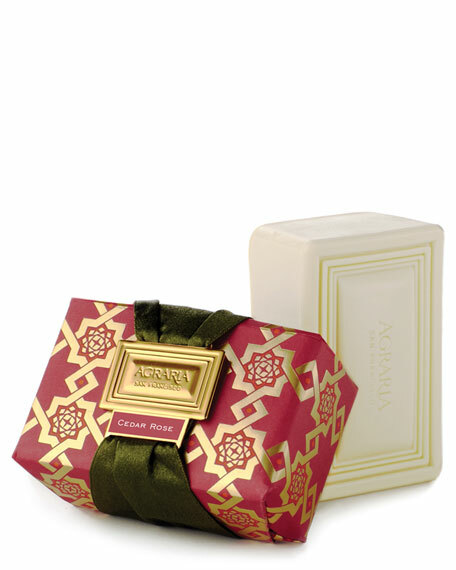 Cedar Rose, is warm woody floral that blends the sultry depth of Cedarwood with the uniquely fragrant Damask Rose. Surrounding the rose are hints of violets and Lily of the Valley. Cedar Rose-A warm woody floral that blends the sultry depth of Cedarwood with the uniquely fragrant Damask Rose. Surrounding the rose are hints of Violets and Lily of the Valley. A warm woody floral that blends the sultry depth of cedarwood with the uniquely fragrant damask rose. Surrounding the rose are hints of violets and Lily of the Valley. Triple-milled in the French fashion, these 8.2 oz. bars create a creamy, silky lather that gently cleanses your skin leaving it felling silky, refreshed and slightly scented. Each bar is hand-wrapped in custom designed prints with gold foil details, and tied with a fashionable satin ribbon laced through a gold Agraria buckle. 100% vegetable-based and formulated with nature's best moisturizers: Olive oil, vitamin E-rich shea butter, yucca oil, kukui oil and sea fennel. 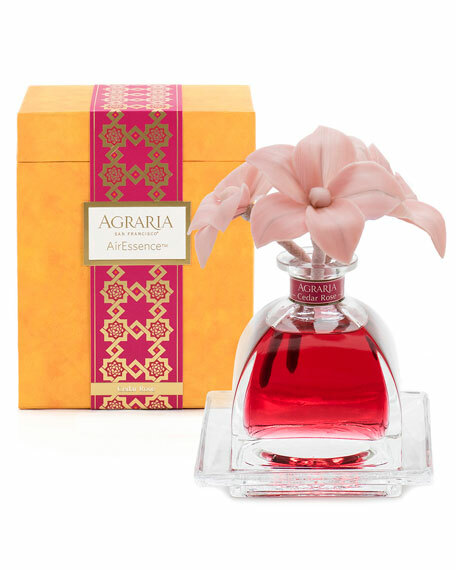 Agraria Cedar Rose Woven Crystal Perfume Candle, 7 oz. 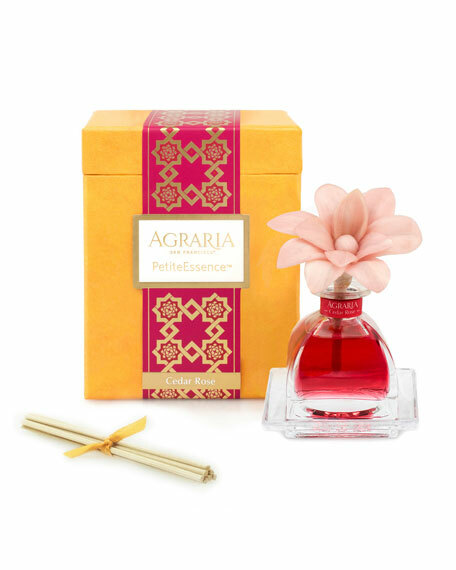 AgrariaCedar Rose Woven Crystal Perfume Candle, 7 oz. 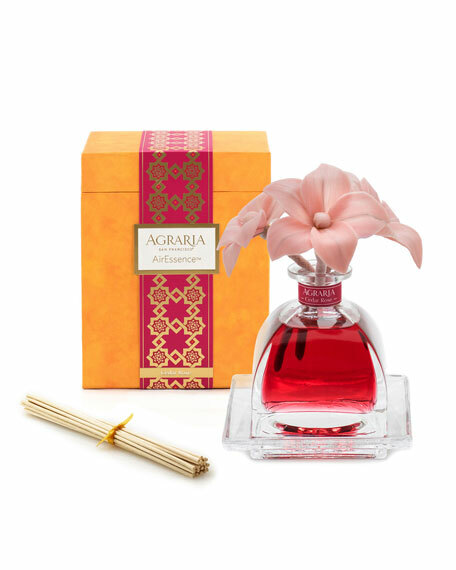 Agraria's Perfume Candles are presented in a woven crystal glass. The design is a modern interpretation of the woven palm leaf cases used for 20 years beginning in the early 1980s. 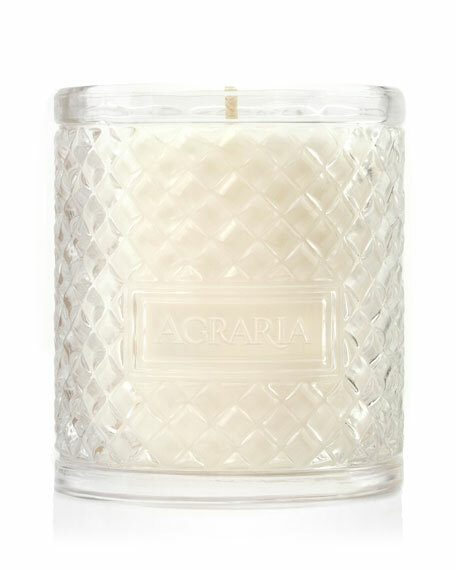 The Fragrance: A warm woody floral that blends the sultry depth of Cedarwood with the uniquely fragrant Damask Rose. Surrounding the rose are hints of Violets and Lily of the Valley. 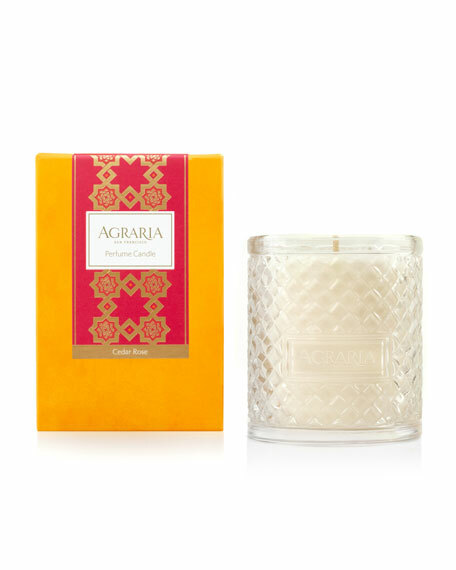 Agraria Cedar Rose Crystal Candle, 3.4 oz. 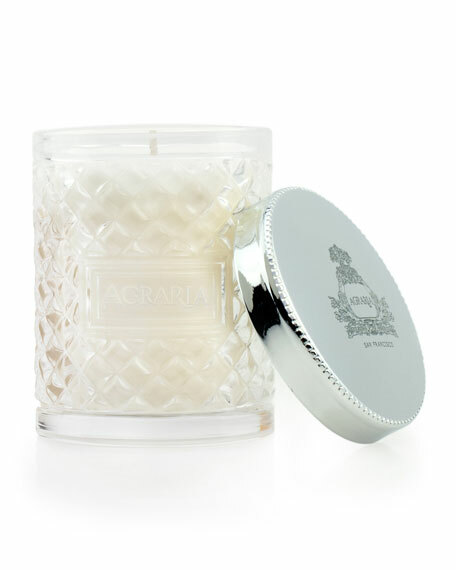 AgrariaCedar Rose Crystal Candle, 3.4 oz. These luminous, fragrant, and clean-burning candles are a special blend of vegetable-based premium soft waxes. Exquisite new packaging and now in a petite 3.4 oz. size (96g), the new crystal cane "petites" have a burn time of approximately 25 hours. 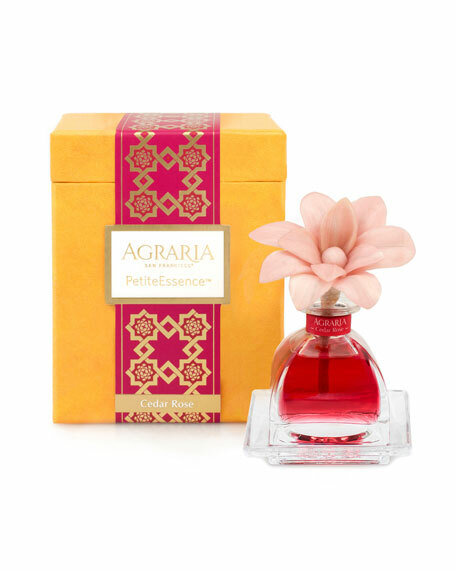 Available in all eight Agraria fragrances. Cedar RoseA warm woody floral that blends the sultry depth of Cedarwood with the uniquely fragrant Damask Rose. Surrounding the rose are hints of Violets and Lily of the Valley. 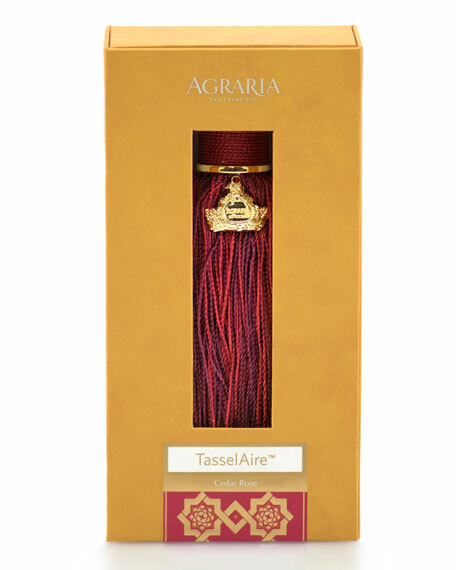 Agraria's new TasselAire is fun, fragrant, and fashionable. 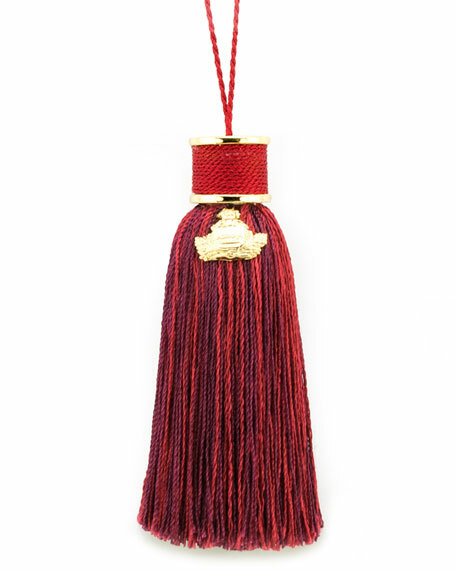 Use them throughout your home as traditional tassels on armoire keys, door knobs and tie-back curtains, or be daring and accessorize your purse and key chain. Designed to mix and match by colors and fragrances. 7" x 3.5" x 2"